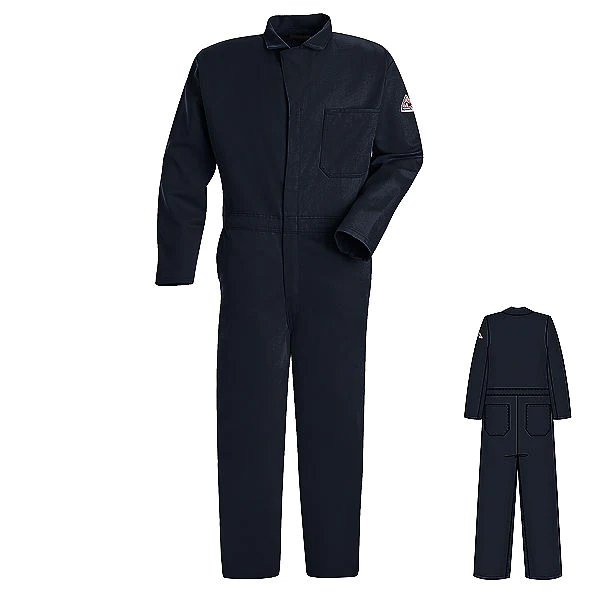 Bulwark Classic Excel FR Coverall, Navy Blue. One-piece, topstitched, lay-flat collar  Two-way concealed Nomex® taped brass break-away zipper, concealed snap at top of zipper at neck. Hemmed sleeves, two set-in front pockets, one chest pocket, two patch hip pockets and side vent openings. Fabric: EXCEL FR® Flame-resistant, 9 oz. (305 g/m²) Twill 100% Cotton. Arc Rating ATPV 1-.6 calories/cm².